"A film of epic portions." Why are Americans so fat? Two words: fast food. What would happen if you ate nothing but fast food for an entire month? 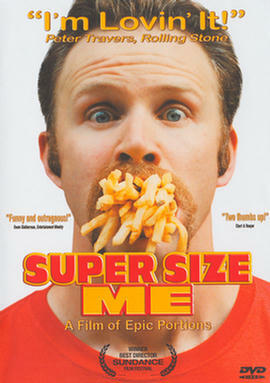 Filmmaker Morgan Spurlock does just that and embarks on the most perilous journey of his life. The rules? For 30 days he can`t eat or drink anything that isn`t on McDonald`s menu; he must wolf three squares a day; he must consume everything on the menu at least once and supersize his meal if asked. Spurlock treks across the country interviewing a host of experts on fast food and an equal number of regular folk while chowing down at the Golden Arches. Spurlock`s grueling drive-through diet spirals him into a physical and emotional metamorphosis that will make you think twice about picking up another Big Mac.